The all new Ford Expedition is one of the top vehicles on the road, and it’s been rated as the number one large SUV by US News & World Report. Drivers are giving high marks to this SUV for its performance and interior features, which includes a ton of new technology. The latest Expedition comes standard with push button start, remote key entry, rearview camera, 4.2-inch display, Bluetooth, satellite radio, and Ford’s MyKey system. However, there’s so much more in store if you decided to upgrade. The full tech package gives you all the control you need with voice-enabled commands that let you turn your driver’s seat into a cockpit. You can feel safe with all kinds of new driver safety features, such as blind spot monitoring, lane departure assist, and FordPass Connect. 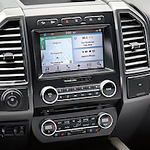 You can check out the latest technology features inside of the Expedition when you go for a test drive at Sheehy Ford of Marlow Heights.